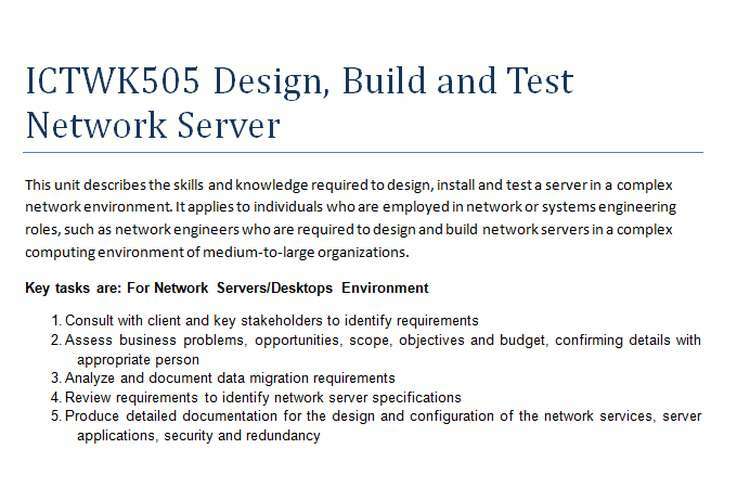 This ICTWK505 design, build and Test Network Server describes the skills and knowledge required to design, install and test a server in a complex network environment. It applies to individuals who are employed in network or systems engineering roles, such as network engineers who are required to design and build network servers in a complex computing environment of medium-to-large organizations. ABC Real Estate office is based in Sydney CBD. They have been operating in a small office for over 5 years. Business has grown and they have now planned to relocate to a new bigger office. Their business team has grown to 15 staff. ABC Real Estate has approached your business XYZ ICT Consulting Pty Ltd to assess their current network and ICT services and hardware infrastructure and have you propose a suitable solution where the new site office will have a new network set-up with new server, router, switches and wireless devices, some new desktops etc so that their business does not suffer any downtime due to office relocating. Their Business critical application is Console SQL DB which uses a SQL server which is hosted in-house and has the following hardware and software configuration. The business also accesses a cloud based software as a service (SaaS) called eSales that has potentials of Active Directory Sync if ABC Real Estate are able to migrate to Windows 2012 R2 server environment. Here again, you do not need to scope the Active Directory Snyc project work for this SaaS. Due to virtualisation requirement for future applications and client web portal, ABC Real Estate needs to procure a server environment running on Linux which could be provided on the same single server hardware, virtualised, with the two Network Operating System Linux and Windows 2008 or 2012 installed. Business critical server is an Intel ‘white box’ (PC) and not a reliable/commercial product. 8GB of RAM is not sufficient for SQL server hosting a 9GB database with multiple concurrent accesses. There is no disk redundancy either through RAID or otherwise on the business critical server. Network equipment is home/SOHO grade and not suitable for a small business. There is no consistent method for remote access. Backup methodology is proprietary application dependent and error-prone due to reliance on physical intervention. Rack/IT equipment does not have any physical security. There is no backup power supply or UPS. 5 x work station PC for Administration staff are running on windows XP which needs to be upgraded to windows 7 or 8 with new hardware. Backups will occur automatically through a scheduled job in Windows server and will be automatically transferred to an external removable drive. Upon failure of the physical server, database can be imported into another server and client workstations reconfigured to connect to the backup server. This will allow quick and efficient recovery should the unlikely occurrence of a fatal hardware failure. Both SQL Server database and corporate share will be copied to the external drive. Linux Server for future deployment of web services are set-up for test purposes. Backup currently will be managed by VM ware solutions.